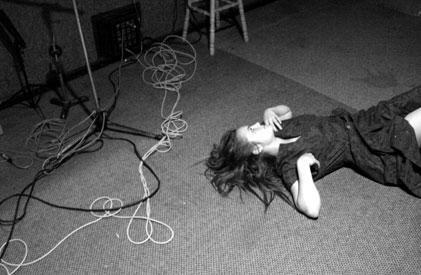 I maybe could have chosen a picture with band band members, but i couldn't go passed this picture of Julia lying on the floor in a studio. You may or may not have heard of this Sydney band so i'll give you a brief introduction. As you know already the band is from Sydney, Australia and they are a brother / sister duo (they aren't married, they're not The White Stripes). The band recently has been snapped up by major label EMI and are set to go to the UK for three months to record their new EP.